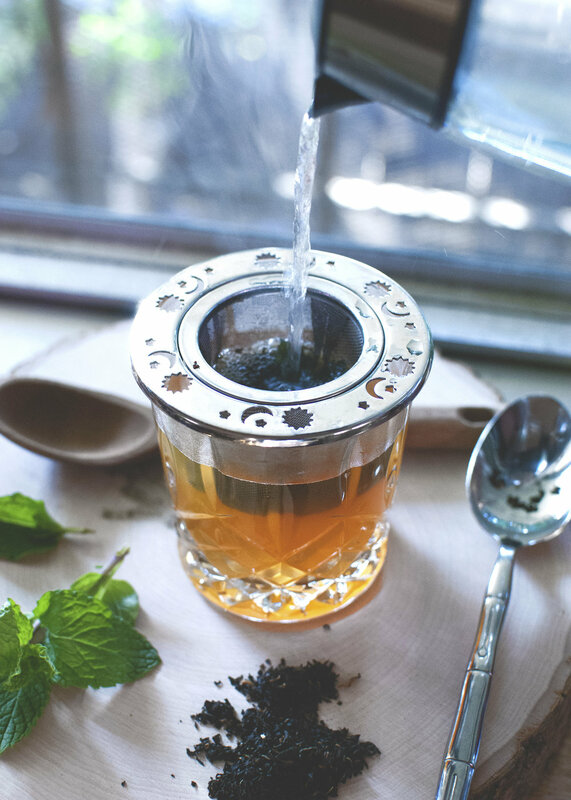 I’ve been blending teas for years, and I’ve learned that the more time I spend learning each herb one at a time, the better I get at formulating a combination of herbs that work together. That’s because the more time you spend with an herb, the better your connection… and the more you know on why you’re using a specific herb, the more powerful and effective your witches brew will be! Put on your pointed shoes, and your pointy hat! Let’s make some tea! Earth - The combination of leaves, roots, fruit, seeds, and flowers. Water - Water is the medium, the canvas carrying the properties and essences of your tea. Air - The steam and fragrances arising from your tea. Fire - The warmth of your tea. Spirit - The ritual of combining the other four elements, and drinking your tea. FIRST… Knowledge is power. For your own safety, please do your own research! Herbs are powerful, and should be handled with wisdom, care, and respect. How do you know which herbs are right for your cup of tea? We know that roses strengthen romance, marjoram welcomes peace and happiness, rosemary encourages sharper thinking, and yarrow supports healing from heartbreak. But what about other herbs? This kind of magical plant wisdom can be found in folk lore, traditions, and our associations with plants. I recommend for a deeper understanding of plants, to think of the nature in the way in which they grow. For instance, dandelion can be found growing in the cracks and crevices of asphalt, very common in polluted cities. It’s leaves are serrated like a lion’s teeth, and it’s flower as radiant as the sun. Dandelion is full of strength and resilience, a great example of grounding and assertiveness and a rising above adversity. Dandelion also holds magic for cleansing, and letting go… and also, carrying wishes and proliferating! You’ll know an herb is right for your cup of tea if you’ve found meaning that makes sense to you. While there are plenty of herbs to choose from, I think a good start to making a witch’s brew is by working with the magic number of three: choose one main herb + two supporting herbs. However, every witch will have their own way of formulating and preparing their magic teas. So, do what works for you — it’s your magic! Step 1. What is your purpose? The first step is to set your intention. Step 2. Select your main herb. The herb that you choose should be a strong representation of the main purpose for your blend. Step 3. Choose supporting herbs: these will enhance the main herb. The way in which these herbs are supportive might be found in the way that they taste, their coloring or color associations, their fragrances, their traditional uses, and their parts (leaves, roots, flowers, fruit, seeds, and bark). For example, I’ll make a witch’s brew for courage. I’m choosing to work with peppermint as my main herb. Peppermint is a good remedy for easing digestive issues caused by anxieties, but there’s more! The digestive system is linked with the solar plexus, which is considered the seat of our personal power. Peppermint strengthens the solar plexus, which governs confidence and the ability to tune into inner knowledge (you know, “gut feeling”). Ginger has grounding powers, strengthens the solar plexus, and it’s spiciness invigorates and stimulates action. Bergamot is a citrus oil that promotes a bright and uplifting mood. Bergamot is commonly found blended with black tea (Earl Grey); black tea and bergamot together are a powerhouse of assertiveness and optimism. Finally, spell it out! Handwrite your recipe, make up a name for your blend, and spell out your intention. You may even want to write out an incantation. Keep it simple, but choose words that evoke feeling, hold power, and inspire your imagination. While you blend your herbs, speak out your incantation: speak it, each time with more power. Then, make your voice softer and softer until it’s quiet and internalized. When you make and drink your tea, meditate on these words. If you’re in a safe, private place, feel free to even sing out these words to a melody. Practice this ritualistically! How much of each herb should you combine? You may want to start by blending equal parts of your herbs. However, herbs vary in weight and volume. So, you’ll have to determine your own measurements accordingly (and intuitively). Keep in mind, one cup of tea will require at least one teaspoon (3 grams) of dried herbs. So, if you are making one cup of tea for 7 days in a row, you will need to blend at least 21 grams of herbs. + a tea infuser, a large mug, a saucer, and a grater. Pluck the leaves, one by one, of three sprigs of mint. Place them directly into your tea infuser. Add a couple grates of fresh ginger and a teaspoon full of earl grey. Speak your incantation while you make your tea. Add boiling water to your cup, and cover it with your saucer. Let your tea sit for 5 minutes, and then strain. Continue to speak and visualize your incantation while you drink your tea.